Craig in Sarasota, Florida Hello, Actually I have only used the Nano-Oil on two of my pistols, nothing that your other customers have not already done. I was having trouble with several new semi-automatics that did not want to feed correctly. I put a light coat of the "80" weight on the guide of the magazines and the ramp into the chambers on both of my new pistols. Now they are feeding with no problems. Amazing what the right lube will do. Thank you for making this product available to the general public. Tim in Two Rivers Wisconsin. "Great Product and Fast Service!My first use of the 10 weight nano-oil was on my old Swiss Army knife. The knife was frequently used on camping trips and had never been oiled in its 15 years of use. I ran the knife through several purges in an ultrasonic cleanser and applied the nano-oil to each fulcrum point on the knife. The resistance on the blades disappeared after opening and closing several times (except for the normal resistance that makes the knife function). I also applied nano-oil to the contact points on the scissor blades allowing them to open and close easier. The knife is in the same condition as when it was new, if not better.I also applied nano-oil to the bolts of a 1941 k98 Mauser and a Winchester Model 70. The lubrication of the friction points on the bolt made the action of both rifles smoother. I have not had time to fully apply or evaluate the nano-oil on the weapons, but the initial application shows some improvement already. "I used nano-oil on the bolt, safety and firing mechanism of a Winchester Model 70 Featherweight. The actions are now effortless in their movement even in extremely cold weather. The lifts and slides easier than a brand new rifle. The safety is quieter and easier to work. The trigger pull even feels lighter. It feels like a completely different gun and performs much better in winter weather. Great stuff!" Brian in Nepean, Ontario Canada. I have been spending some time looking for a better gun lubricant after a gun oil failed a shooter I was coaching while we were in Thailand this summer. She was shocked when I relubricated her gun and it "felt better". I realized there is a complete lack of knowledge of what shooters should be using, and how a well maintained/lubricated gun can truly help shooter achieve better scores and help their pistol last. I am please to write you and tell you that my experience with Nano-Oil has been great. While reluctant at first, I am convinced this lube is fantastic and makes a noticeable difference in the feel of my competition pistols. I'm Brian Baleno and I first found out about your product through Scott Clawson. I had an aluminum flashlight with galled threads, by shear force I unscrewed it. I thought it was a goner but Scott put some of your Nano-Oil on it and threaded it back together. It came right back apart with minimal force, we wiped the threads clean and gave it another drop for good measure. It felt like a brand new light after that. That was 4 months ago and its still turning fine. Now I am the proud owner of your fine product, thanks for the great service too. Jim in Talking Rock, Georgia. Amazing. It made my knives feel like assisted- openers!! Super smooth! John in Redditch, Worcestershire England. Wow received my nano-oil pen today, super fast delivery how did you do that in three working days. I am very happy with the pen, I have already put it to use on my swiss army knives and also hand cuffs both now operate a lot smoother,great stuff. Applications for this seem endless in my opinion. A couple of questions for you, can this be used on my flashlights ? also can I get extra nano-oil to refill my pen. Once again thanks for a great product and lightning speed delivery, super. James in Stevenson Ranch, California. This stuff works great! Really worth a try. StClaire is easy to work with too. Thank you very much for the opportunity to comment on Nano-Oil 10 weight advanced lubricant. 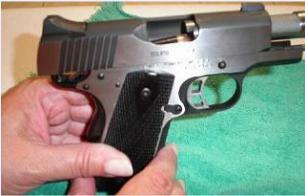 My primary application is my Kimber Eclipse Ultra II.45ACP 1911 pistol. This pistol has a persistent feeding problem owing to the steep angle of the ramped barrel and short frame design. I applied Nano-Oil to the barrel and feed ramp along with the Sear, hammer, mainspring housing, and slide rails on the slide and frame. I noticed an immediate improvement in feeding with the lubricant versus RemOil® Teflon lubricant which leaves a sticky residue that Nano-Oil does not. I have also used a very thin coat of Nano-Oil on the pistol's magazine which greatly improves magazine release and loading. I have used Nano-Oil on several locks in preparation for winter weather and expect much improved performance. I have also used Nano-Oil on several of my power tools (DREMEL®, Porter-Cable, etc.) and plan to use Nano-Oil on my Snowblower cables when I prepare it for the winter season. ------ Forwarded message ------ StClaire was not aware of this test being conducted by Officer Roberts who purchased Nano-Oil. I am Ben Roberts. I work as a Police Officer for a small Police Department just outside of Birmingham, AL. AR-15, M-4, M-16 Advanced Armorer, Remington 870's,11-87's, and 700's. I also own a small Gunsmithing Business. I try dozen of products throughout the year to make my life easier. When something gives me positive results on my personal firearms, I then find an opprotunity to run it thru a battery of test to make sure it works before I can recommend it. Nano-Oil is one such product. ( five days, 1500-2000 rounds ) that I was instructing for 30 students. Each student was issued a brand new 16" flattop AR-15 rifle with a collaspable stock. I cleaned each rifle, degreasing everything. I lubed 15 rifles using Nano-Oil 5wt. (Group A). The other 15 rifles I used a leading gun oil (Group B). I recorded the serial numbers for each rifle to track which rifle had what lube. For my "Control" I cleaned and degreased rifle #31(same as the other rifles) but did not apply any lube at all (this rifle was used by the instructors to demo the different firing courses throughout the week). Group A and B was divided into three Sub-Groups / five rifles each (A-1,A-2,A-3 and B-1,B-2, B-3). Groups A-1 and B-1 were lubed four times each day. Groups A-2 and B-2 were lubed twice each day. Groups A-3 and B-3 were lubed once a day. The control group was not lubed at all. The start of each day for all five days, all students cleaned and degreased their assigned rifles (bore brushed, simple green). I lubed each rifle according to the Group and Sub-Group, the Control rifle was not lubed. Control Rifle had one failure to extract and twelve failures to feed. At the end of Day 5 I had the students from Group A swap with Group B for cleaning. All 30 students agreed that the Nano-Oil lubed rifles cleaned up faster ( up to half the time ) than the other brand lube. The Nano-Oil lubed rifles did not have carbon build up compared to the other rifles. Also the Nano-Oil lubed barrels cleaned up with fewer strokes and fewer patches. The Control Rifle took the longest to clean during every session. Carbon build up was a major problem. There were several shiny spots from the metal to metal wear. The bolt looked as if it had 10,000 rounds thru it. The bolts from Group-A looked brand new. After cleaning ALL rifles were lubed with Nano-Oil. The students were not aware of test or results that I conducted during their training. Both oils were used from identical needle oilers but with two different colored needle caps. Without hesitation I fully stand behind Nano-Oil and recommend it to everyone that owns a firearm. Just the faster cleaning time is enough for me, but the fact that there is less wear on the metal results in firearms lasting longer.